Pendant jewel; gold; centre: Charity with three children standing beneath an arch; pilaster at each side set with diamonds and rubies alternately; surmounted by Cupid playing musical instrument; beyond each pilaster is figure, one representing Faith, the other Fortitude; top set with emerald flanked by two scroll masks; beneath centre is large emerald between two lions; below, group of fruit and three pendant pearls; back of architectural design of four arches surmounted by dome, with enamelled frieze below. See below for previous Tait catalogue entry on this object from 1986. The object is now thought to be 19th century, made in Paris. Origin: German, or possibly Netherlandish (Antwerp? ), third quarter of 16th century. Commentary: The introduction of the engraved designs of Erasmus Hornick into the repertoire of the German Renaissance goldsmiths apparently transformed historiated pendant jewels by giving them a very pronounced 'architectural' character. Some of his engraved designs that are very close in character have been preserved in the Kunstsammlungen, Veste Coburg; they were first published in Nuremberg in 1565 (see Hackenbroch 1979, fig. 426A-B), and it is likely that this type of pendant jewel was at its most fashionable c. 1550-75. Erasmus Hornick was born in Antwerp, where he learnt the craft of engraving but was also trained as a goldsmith. He settled in Augsburg where he married Afra Haug, a patrician's daughter, on 27 July 1555, and three years later was recorded in the Augsburg Steuerbücher (rate books), being assessed at 2 florins 20 kronas. While his many pattern books were being printed, he went to live and work in Nuremberg (1559-66), was granted honorary citizenship in 1559, and was admitted a master of the Nuremberg goldsmiths' guild on 6 November 1563. His years in Augsburg after 1566 were evidently not exclusively devoted to the art of the goldsmith and, although he is described as such in the archives, when he remarried in 1570 after the death of his first wife, Afra, he was described as a 'freykunstler', which probably indicates a self-employed status. Indeed, the Nuremberg City Council recorded its decision in May 1578 to reject an offer from Hornick concerning his new inventions relating to artillery and military devices; although they are not described, they are an indication that Hornick may have extended his activities well beyond the confines of his craft as a goldsmith. To what extent Hornick was a practising goldsmith with a full-time workshop is not yet known. However, his career was so successful that in 1582 he was appointed to the Emperor Rudolf II's staff at the Imperial Court in Prague, where he was to join the Kaiserliche Hofwerkstatt at six gulden a month; unfortunately, he died the following year - not in 1573, as stated in Hackenbroch 1979 (p. 157). No piece of jewellery or goldsmith's work can be identified as his creation, though some hundreds of drawings and engravings have been attributed to Hornick (John Hayward, The Goldsmiths' Designs of the Bayerische Staatsbibliothek re-attributed to Erasmus Hornick, ‘The Burlington Magazine’, April 1968, pp. 201-6). Although this Waddesdon pendant cannot be attributed to his workshop, it is closely related to his style of design. However, the Antwerp origin of Erasmus Hornick makes the attribution of this type of 'architectural' pendant to a German (Augsburg?) workshop highly problematical because this type of jewel has equally close affinities with the Antwerp designs of Hans Collaert the Elder (c. 1530 - before 1581). (For a further discussion of Collaert's contribution, see cat. no. 11, p. 106. [WB.153]) In particular, the Collaert designs which bear not only his initials, HC, but also those of the unidentified monogrammist, EVG, have very similar architectural settings for the figures (see Hackenbroch 1979, fig. 628 A-B) ; indeed, features like the tall round-headed windows, the niches surmounted by a drum-shaped cupola, the overall proportions, are all remarkably similar. Furthermore, the portraits of the ladies of the courts of Denmark and Sweden and of the rich cities of Northern Germany during the second half of the sixteenth century testify to the prevailing fashion for this heavy, massive, quasi-architectural figural jewellery, especially necklaces, collars and pendants worn over high-necked costumes terminating in ruffs. This taste is also recorded in most reliable detail in Mores's coloured pen drawings made between 1593 and 1608 (see R. Stettiner, ‘Das Kleinodienbuch des Jakob Mores in der Hamburgischen Stadtsbibliothek’, Hamburg, 1916). The Hamburg goldsmith, Jacob Mores, together with his two sons, Jacob the Younger and Hans, apparently supplied much of this jewellery by first sending his sketches and detailed coloured pen drawings on parchment for approval and then, having obtained a firm commission, making the jewellery in his large workshop in Hamburg. There is documentary evidence that he received commissions from both the Swedish and Danish royal families, as well as the patronage of the Dukes of Schleswig-Holstein, and the Archbishop of Bremen - even from the King of Denmark's brother-in-law, the Elector of Saxony. It seems clear that Jacob Mores must have employed many assistants and that not all the jewellery was made by his own hand; however, his famous design for a great necklace and emerald pendant has all the characteristics of this Waddesdon pendant jewel, including the caryatid and other enamelled figures subordinated to the quasi-architectural elements with their rectilinear pattern of table-cut gemstones (see Hackenbroch 1979, p. 213, fig. 583D). 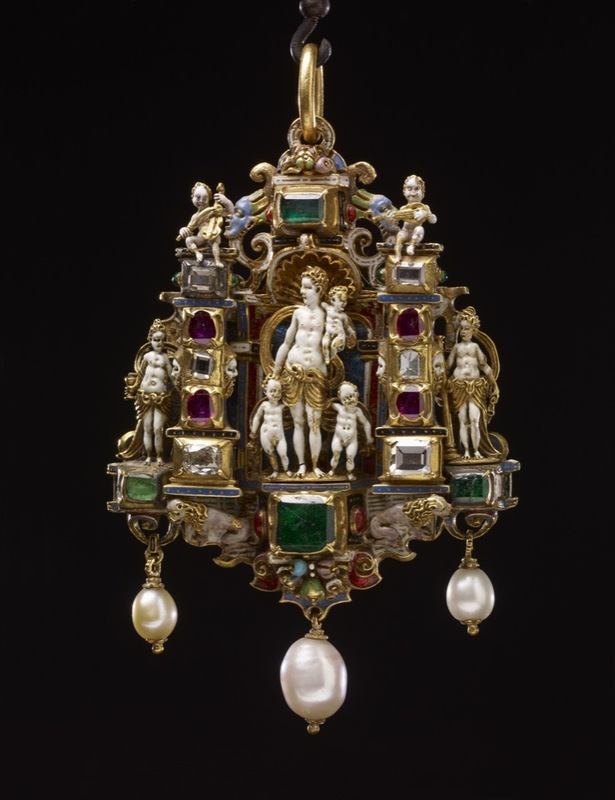 The German origin of the Waddesdon jewel seems even more probable when it is compared with one of the very few documented versions to have survived - the famous Loves of the Gods pendant jewel (after Erasmus Hornick) in the Historisches Museum in Basle, Switzerland. It is a lead cast - not, as previously published, a lead model (see Hackenbroch 1979, p. 158). Its importance lies in its historic provenance traceable to the seventeenth century when the Basle University acquired two major private collections - the 'Museum' of Professor Remigius Faesch (1595 - 1667) and the Amerbach Cabinet of Curiosities. The lead cast of the jewel, along with some fifteen similar casts of jewellery, was most probably in the Amerbach Cabinet (purchased by the University in 1661) but, as yet, no archival confirmation has been found. If these lead casts of jewels had, indeed, been acquired by a member of the Amerbach family, then it seems unlikely to have occurred after the death of Basilius in 1591; he was the last of three generations of eminent Amerbachs, all of whom contributed to make this Cabinet one of the most important monuments to Renaissance learning north of the Alps. Unfortunately, nothing is recorded of the early history of these lead casts of jewellery, seemingly made after the gem-stones had been removed and before the rather worn gold was melted down and refashioned. The Basle lead cast, despite its blurred outlines, offers valuable evidence of the former existence of one gem-set jewel of very similar design to the Waddesdon pendant jewel, even in the use of couchant lions beneath the pilasters on either side and masks on the sides of those gem-set pilasters. The lack of definition in the cast is, no doubt, due to the loss of enamel and the damaged surface detail of the gold original, but its stylistic qualities and its survival in Basle within one of the historic collections of the City, helps to confirm the Southern German origin previously proposed for the Waddesdon pendant. The crude, flat reverse of the lead cast in Basle, however, offers no clues to the design of the reverse of the original in enamelled gold; if a cast was taken, it appears not to have survived. The tendency to introduce architectural perspective into the background of figure scenes in Renaissance jewellery had begun before the middle of the century and perhaps the famous commesso jewel of Leda and the Swan with Cupid in the Imperial Schatzkammer in Vienna is one of the best known examples of the use of a gold enamelled background of round-headed arches (Evans 1970, pl. 63a; E. Steingräber, ‘Alter Schmuck’, Munich, 1956; English trans. ‘ Antique Jewellery’, London, 1957, p. 113, fig. 186). In the Grünes Gewölbe, Dresden, the pendant jewel of Faith exemplifies the German taste for decorating the backs of pendants with these almost flat architectural designs; the back of this Dresden jewel (Hackenbroch 1979, fig. 568B) creates a similar effect to the arcade on the reverse of the Waddesdon pendant jewel and, again, helps to confirm the dating of the jewel to the decade 1570-80. The statement that the two enamelled lions beneath the pilasters of the Waddesdon pendant are here introduced as emblems of the ruling Wittelsbach family of Bavaria (Hackenbroch 1979, p. 160) is an attractive theory; but, without any supporting documentary evidence, such an idea must be viewed cautiously and, perhaps, does not quite justify the suggestion that the jewel was commissioned by a member of the House of Wittelsbach, although caryatid lions of a similar type do occur in the Three Magi Hausaltar in the Munich Schatzkammer (see Ulla Krempel, Augsburger und Münchener Emailarbeiten des Manierismus, ‘Münchener Jahrbuch der Bildenden Kunst’, XVIII, 1967, p. 141, fig. 33; no. 19, pp. 177-8) which was already recorded in the Inventory of 1626. Finally, attention is drawn to the preservation in the Kunsthistorisches Museum in Vienna of a historiated pendant jewel of Moses Striking the Rock (illustrated and discussed in cat. no. 6, p. 84 [WB.152]), because both in the figure style and in the distinctive treatment of the drapery (with its many rippling folds in close parallel lines) it seems to have a common origin. Hitherto, the Moses pendant jewel has been attributed to a German or, most recently, to an Augsburg goldsmith's workshop. Hugh Tait (ed. And contrib. ), ‘The Art of the Jeweller, A Catalogue of the Hull Grundy Gift to the British Museum: Jewellery, Engraved Gems and Goldsmiths’ Work’, London, 1976, pp. 178, no. 293, illus. Dora Thornton, 'A Rothschild Renaissance: Treasures from the Waddesdon Bequest', British Museum, London, 2015, pp.212-219.